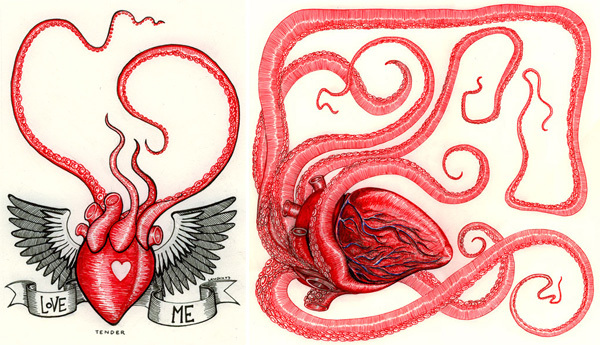 Ben Lawson draws incredible fish that we first fell for over at .org #7943 and with Valentine’s Day around the corner, i simply had to post his tentacled hearts. His illustration style is so scientific, yet the characters (yes even the tentacled hearts) are oozing with character, which is no surprise since he is a physicist/engineer turned artist/illustrator… and he is certainly our kind of guy - his career “includes sourcing squirrels for Rumanian TV and reporting on nuclear terrorism for the Japanese government.” Can you imagine how incredible these would be animated? And for those who need a refresher, a few of my favorites of his Ichthyological Specimens are after the jump.